About 50 percent of those bullied have had stress-related, health problems as a result. One thing is for sure: this kind of treatment is not acceptable, not deserved, and any kind of behavior that resembles bullying shouldn’t be happening in any work environment. Let’s take a closer look at some of the signs of workplace bullying, and what you can do to work against it becoming an issue in your company. What is workplace bullying? It can take many forms, but according to the Workplace Bullying Institute, workplace bullying is any kind of treatment that is repetitive and abusive in nature. That can be threatening, humiliating, intimidating, or any combination of those. It can also include forms of verbal abuse, in some cases. It’s a kind of mistreatment that can not only can impact someone’s health, but it can also prevent them from getting work done. Obviously, that’s a significant issue! You may be surprised to learn who is a workplace bully. Do You Know Someone Being Bullied at Work Today? Sadly, often times the person who is being tormented is being targeted because they are perceived as a threat of some kind. The Workplace Bullying Institute’s research on the so-called “targets” of bullying saw that often times, the targets are a company veteran and/or the most skilled person in the workgroup (2). Many HR and safety managers, understandably want to prevent workplace bullying. They also want to be able to put an end to it if they suspect it may be an issue already. The answer to how this can be done: company culture. Let’s take a closer look at what you can do to shut it down. 1. 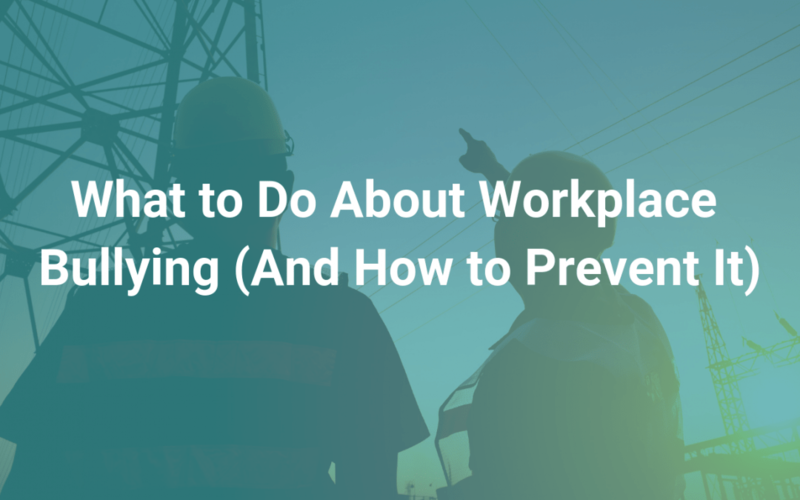 Take steps to make sure workers know what workplace bullying is. If it’s identifiable behavior, that means it can be appropriately called out. Don’t be blinded by high performers or the person who is doing well in their job; believe it or not, these people can still be bullies. Get clear on what is—and what is not—acceptable behavior in your company. 2. Train your people on how to shut it down, on the spot. Do workers know how they can respond to a bully if they deal with one, directly or indirectly? And do they just let this mistreatment happen without addressing it, right then and there, if they witness it? Don’t assume all your staff know the right way to deal with someone, in-the-moment, who may be toxic (3, 4). Also be sure employees feel equipped and empowered enough to say something if they see it happening. That may require ongoing training, which can be well worth the investment. Give workers some sort of space or tool that can allow them to report what they are seeing. 3. Create a script to manage any bullying incidents. If you are going to sit down and have a conversation with someone you suspect may be a bully, have a script readily available to help address the issue. You want to be as prepared as possible to put an end to any bad behavior. This gives someone the option to adapt their behavior and to stop the mistreatment of others. If they come up with excuses or are unwilling to commit to change, do what it takes to remove them from the environment. 4. Dig for the full story. Last, have metrics in place that can help tell the whole story about the workplace climate. Identifying and knowing about bullying is part of the solution, but you also want to know why it’s really happening—so you can fix that issue, too. That’s where a platform like iReportSource can be helpful so you can see unbiased, actionable data points and stats that tell you more about the whole story. A company’s culture is always in flux, and you’re never going to be completely immune to any and all bullying. But despite how a company culture is always going to be evolving, you can still do your best to create a stable environment where norms, values, and acceptable behavior is clear (1). Our analytics dashboard will show you everything you need to be completely confident: from ROI, cost savings, the number of safety trainings completed and much more about the ongoing state of your culture—and that is all with the click of a button. Are you ready to use data for better decision-making in your company? Learn more today.